Well, if you’re a chocoholic & can’t ever get enough chocolate (like me! ), then this is the recipe for you. Prep. time: about 5 minutes. Costs less than $10. Feeds 8 – 10. In a medium saucepan, mix bittersweet chocolate chips, milk chocolate chips, & heavy cream. Heat over medium-low heat, stirring constantly, until melted. Remove from heat and pour into crock-pot. Add vanilla extract, whole milk, & sweetened condensed milk to crock-pot & stir. Cover & heat on HIGH for 1 to 1 1/2 hours or until hot. 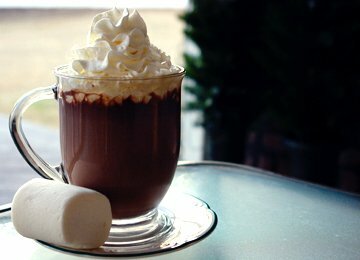 8 Responses to "Decadent Homemade Hot Chocolate"
You seem to outdo yourself with each new recipe. My mouth is watering already for your decadent, delightful, tasty new drink! Hi lovely Sandy!! It IS heavenly, at least I think so . . . let me know how it turned out. Cheers, darlin. Seriously, being lactose intolerant, about how much lactaid am I gonna need for that bad boy? I hope life’s treating you well, as always, my friend. Take care. No worries . . . I answer to most anything ~ lol. Ha, ha, your comment made me laugh . . . horror writers using the word yummy! 😀 Well, if you don’t have an entire bottle of lactaid around, you could probably make it with soy milk (the chocolate ought to drown out the soy milk taste). I’m doing great, thanks. I hope you are, too. Cheers, my friend.